We’ve explained to a few people that we are taking this weekend off. We are attempting to step out of the craziness and business of the world and just take a moment. I’ve been fascinated by the idea of a “Sabbath”. It is generally seen as a day of rest or a time of worship…..but in doing a little reading on it…..and mind you, it was very little reading, so I’m not claiming any sort of real adherence to a true Sabbath….the idea of time away, time apart, a time of rest and disconnecting with the world and reconnecting with family and friends sounded amazing to me. We have tried this before, always with good intentions and typically called it an “electronic free” weekend. We have taken away ipods and phones, turned off computers and TV’s and even turned off lights and once night we just used candles for light. This weekend we are taking a Sabbath, and me being on my computer is technically against our rules, but the 3 bigger kids are at Youth Group and Jon is out for beers with a friend and the two littles are sleeping. I wanted to record my thoughts and feelings about tonight because it moved me so. I wandered around the house after the little boys fell asleep and started to light the candles that I had put in place earlier in the week. (We tried candle light one night earlier this week to see if we had enough candles to make it comfortable to “be” together and not so dark that we couldn’t play a game or talk.) It felt so calming, like I was mentally and emotionally and physically slowing down and “settling”. I lit some candles and turned out some lights. Picked up a few stray toys that were lying around. 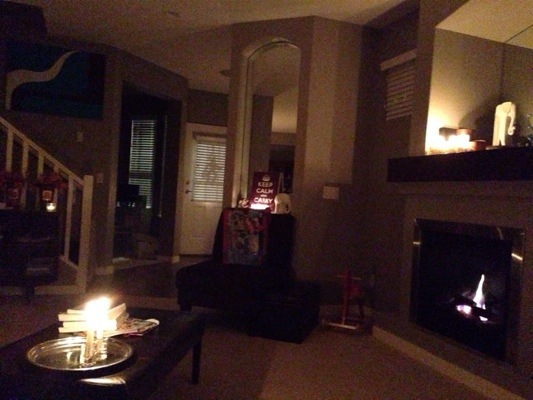 Lit a few more candles and turned out a few more lights…. We are so “on the go” and I’m really looking forward to stepping out of “everything” and just being. I have our meals planned for Saturday and Sunday. Including things like Crockpot Porridge and Chicken Soup and a Chicken and Rice Casserole…..other things too that are easy and quick to throw together, like sandwiches or just meat and cheese and pickles and crackers. The kids have had a week or so to process and the intital “FREAK OUT” about no electronics has turned into ideas of things we can do as a family. The intense emotional connection to the internet and social media has been replaced by this calm acceptance and a remembrance of the fun times of playing cards by candle light, from the last time we did this. Even my own thoughts of being away from my phone and from social media have died down and I realize that nothing is going to change if I don’t look at my phone for two days. I’m not going to miss any thing major. I’m not really needed “on the web”….and yet, here I am blogging. HA!!! We tried to do this once a month before and did about 3 half assed months before we stopped making it a priority. I do hope we can really make this a priority and for longer. I’m not in a fantasy dream world where we are going to sit around playing board games and drinking hot tea and cocoa all day while having a sing along around the fire place after dinner…. I have 5 kids. 5 LOUD, CRAZY, ADHD, ANXIETY, AUTISTIC, PMSing, AMAZING, CREATIVE, FABULOUS, LOVING, EXUBERANT, MESSY and NOT AS HELPFUL AS I’D LIKE KIDS. It’s pretty much guaranteed that someone is going to meltdown (every hour) and yet….for us parents to not have to be fighting against the ipods and internet and TV and Minecraft…….it will be “different”. You know, once they start to detox from their electronic addiction. We actually bought a small safe to put the electronics in….so that way no one is tempted to sneak theirs out…..ha ha ha! Actually as goofy as that sounds, it totally helps Jeremy because he has a crazy attachment to his iPod and knowing exactly where it is, puts his mind at rest. He’s not wondering where we hid it, and how can he find it, and where should he look so he can “sneak” it back…it’s just in the safe and when the time is right, he gets it back. I wish we had thought of that sooner. Would have saved us a whole lot of grief and fighting. Oh well, I’m going to sign off now. See you on Monday. I hope your weekend is full of rest and peace and joy. This summer has been a good one. Different, but good. Most years, we have gone camping but with buying a house this year and Jon and I needing “sanity time”….camping just wasn’t in the cards this year. Having a “backyard” has been so incredible. The stress of living in a townhouse (while having 5 active children and an incredibly grouchy Strata Council) was more than I could bear and this place has been an absolute blessing in SO MANY WAYS! Probably the highlight of the summer – aside from our amazing trip to Mexico – has been just hanging out with my sisters and nephews and nieces. A couple of weeks ago we headed out to Ambleside Beach in West Vancouver. It might seem crazy to drive from Langley to West Vancouver when we could go to White Rock, but honestly, it’s so much easier to get our enormous brood and all our crap from home to beach if we go to Ambleside. And………because it’s all highway driving, it takes the same amount of time – 45 mins from door to water. I think the biggest production was getting our gear from the vehicles to the sand. With 3 mom’s and 11 kids (but only 10 were on this particular trip – Jer was at a nerd convention – ie. Minecraft meet up), there is a colossal amount of “stuff”. We managed it all in one trip…..cause we are amazing like that. Once we found “the perfect spot” we set up the shade tent, parked the babies underneath it and started slathering kids with sunscreen. I have no idea how he did it, but the instant I got Judah slimed up – he managed to cover himself with sand…..which, while I think is nasty, I’ll admit it does offer an additional level of sun protection. It’s so fun having kids that are around the same age. The big girls all play together so well….although as teenagers – there is a lot more laying around and a lot less playing. Jack, Zac and Judah are all 3 years old and they alternate between playing incredibly and fighting like baboons. Which I’m sure will carry on throughout their lives….and it’s so fun to see them growing up together. This particular day, they were all playing so well together. It’s so neat hearing them chattering at each other at a 3 year old level with their lisps and mispronunciations. It’s absolutely darling. As happens wen you are at the beach, there was a lot of sand EVERYWHERE and a lot of really gritty food. YUCK! Nothing says yummy quite like gritty watermelon, carrots, and sandwiches…. The girls went exploring up and down the beach and found a red jelly fish. It was pretty exciting until Xani got stung….then it was slightly less fun…..but still super cool to have found the giant slimy creature. I might be totally biased, but I think I have the cutest nephews ever. We went crab hunting and taught the little boys how to hold them by pinching them from behind. We found some crabs that were smaller than dimes and those ones were less scary to hold than the bigger ones. But this dead one was the least scary of all. I love it when I find interesting things to snap a quick photo of and Ambleside didn’t disappoint. I’m sure that this orange rock was covered in some toxic sludge in order to make it this amazing color, but regardless of the reason….it was still beautiful surrounded by all the green seaweed. I’m so thankful for my sisters and all the love and support they give. I love that our kids are growing up together. I’m thrilled that we get to spend time together making amazing memories. Do you have special memories of summers spent with family? Has this summer been a good one for you? What fun things have you done? I’d love to hear about it, if you’re willing to share. If you’d like to see some more pics from our beach day, click here. A couple of weekends ago, we were gifted with the opportunity to stay in a cabin down at Birch Bay. We weren’t sure what to expect, but the thought of “just getting away” from everything was huge and so we threw 1 change of clothes, a set of pyjamas and our toiletries into bags. We threw some bedding into the van, grabbed our passports and headed over the line. We left our house later than we would have liked, and as a result arrived later than we would have liked. We also had to stop and pick up a few groceries once we hit the States. I am SO thankful that Jon had planned up a rough menu for us as my head was just not screwed on right and it took everything I had to just get us ready and even when he came home from work……I still wasn’t “ready” for us to go. I find that aspect of all of this to be one of the more frustrating things. I just can’t keep things straight in my mind right now. I’m too exhausted. I’m missing things and other thigns are slipping in between the cracks and in a lot of ways, it ends up costing our family. the fact that I can’t organize things like I used to is costing us….it’s costs us time and money and energy and adds stress. I HATE that I feel like I’m adding to the overall burden. But, I’ve reached my max….almost 2 years in and I’ve realized that i very definitely do have a “limit”. I cannot do it all. That alone is humbling and depressing and so very VERY frustrating. It’s not that I thought I COULD do it all, but I know that I can handle a lot…..and knowing that I’ve reached my limit……*big sigh*….it’s tough! Anyone who comes has a big family, knows that “vacation” has a very loose interpretation of the word. It’s more like a change of pace or change of scenery for the parents. There is still much to co-ordinate, and meals to make and clean up from. Meds to dispense. Kids to put to bed….and hopefully, if we are very blessed….a small bit of rest to be had. We arrived at the cabin and unloaded everything. The kids were SO excited to be there. They immediately set off exploring the cabin and the property; and we were so warmly greeted by the neighbors. It was so nice. We made assigned the kids rooms and made up beds and dispersed bags to the appropriate rooms and finally got the kids in their pyjamas and settled and then Jon and I headed to sleep. In spite of the busy-ness of arriving…..the place felt peaceful. I could hear the waves crashing and could smell the wet sea air. It’s a good thing that Jon and I went to sleep as soon ans we could because the boys were up bright and early. I think Jeremy was the first up….he was the most excited out of all of us to be there. He was alomst quivering with excitement. The kids occupied themselves while Jon and I prepared breakfast. Judah found these Duplo blocks and spent a ton of time building “legos” with them. It was so cute to see him play like this. We actually pulled out our own Duplo blocks once we got home and he has spent many happy hours playing with the box of Duplo. After breakfast, we headed on down to the beach….. It was still pretty cold at 9am in the morning, but the boys were determined to be outside, at the water’s edge. Judah was thrilled to be getting dirty. He’s a true boy. The boys walked up and down the beach front…. It was so nice to see everyone relaxing and smiling and just forgetting about everything for a while. We skipped rocks and found crabs and watched excitedly and with great anticipation for the tide to go out. Siah got a bit cocky and what do you don’t see, is the next picture where he is running for the shore with his boots full of freezing cold ocean water. He waded out far enough and a wave came in strong enough that it washed right over the edge of his gumboots. Judah was So excited to be out splashing int he water too. He was initially cautious and then his excitement and curiosity go the better of him and in the end, he ended up falling into the water despite our repeated warnings and got soaked…..
Geli found a path out to a sand bank and loved the feel of the cool sand in between her toes. My kids have always been water bugs. I think it must be in their genes….they are so attracted to the water and seem to thrive in any water environment. By this point, we were getting chilly, between the cold water and the cold wind…BRRRRR! SO we headed back inside to get a bit warmed up. We played some games and ate some popcorn and just relaxed. Here is Geli goofing around with a water bottle. The bottles boasted that they used 50% less plastic and well…it certainly seemed so as the bottles were so flimsy. After a while we realized that the tide had gone WAY out and had left some amazing looking tidal pools that were just begging to be explored. The birds were out and the sun was shining and it looked amazing. It was so incredibly beautiful out there. There were miles and miles of beauty just begging to be photographed. We found the coolest looking shells and weird shrimp looking things, crabs and other sea creatures, including sand dollars. Jeremy had noticed a fire pit back up in the yard and was desperate to roast some marshmallows. We headed back up and the kids made a huge mess of themselves. I don’t know how you get marshmallow spread out over your face from your eyebrows to your chin….it’s a skill, I tell you. There were SO Many great photo opportunities. If you are interested in checking out my WAY TOO MANY photos….click on this link. It was an amazing time and I was so grateful for the opportunity to get away. What an absolute blessing. It was exactly what I needed exactly when I needed it. It was a little slice of heaven in our crazy lives. Thank you! THANK you! THANK YOU!!!! for this incredible opportunity. We are so blessed. So, we are almost at the American Thanksgiving and so I figure that I’m still good to share our family’s Thanksgiving day Celebration. We arrived home from Angelica’s Wish Trip on Saturday October the 8th. Before we left on the trip, we were throwing around the idea of having my family come over to celebrate Thanksgiving on Monday October the 10th and just a few days before we left, I told my sisters that it wasn’t going to happen. I had a feeling that we’d be a bit wasted from our trip AND I figured that the “clean up” from the trip would take more than a day. We agreed to celebrate Thanksgiving a week or so later. I AM SO THANKFUL that I put that off by a week. There is NO WAY that we could have been ready. Well, I suppose that I could have stayed awake for the next two days and gotten everything done, but I am so Thankful that I didn’t have to. I would have been such a basket case with that extra pressure and stress and UNNECESSARY STRESS is something that I’m trying very hard to avoid in my life right now. This means that I’m saying no a lot more than usual as I try to balance our lives. I’m thinking twice or three times before I say yes, and trying to live within my abilities and not overstretch myself. Anyway, I was trying to share our Thanksgiving pictures. It was such a great day, even if my Mom and Dad couldn’t be there. My Momma was in Romania on a missions trip and my Dad was out in the bush hunting. And so it was the first time “holiday” where it was just us kids and our families. Even without my parents, it was still such a fun day. Everybody brought food for the feast and it was all so delicious. I was so busy trying to organize and arrange things that I totally forgot about taking a picture of all of us at the table….oh well! Denver looks so thrilled to have his picture taken, no? There were cuddles with our special Aunty Brynn…she is just so beautiful, isn’t she? Here Judah thinks he can use two iPhones at once….maybe he wanted to talk to both Nana and Pappa? The littlest member of our family is getting bigger and he’s just so STINKIN’ CUTE! Here the boys are just having a friendly competition on Baby Piano! It was AWESOME! Okay, so that’s probably not what they were doing, but it sounds good, no? It’s so much fun to have cousins that are your age…it’s like ready made best friends! It was such a fun day and I can’t wait until we can get together and do it again. I’m so thankful for my family. They are a pretty awesome bunch! If you’re interested in seeing all the photos from Thanksgiving, click here! We woke up on Friday morning and rushed outside to our balcony because we knew that we should be close to Castaway Cay. We were close. Once we docked, there was still some time before we were allowed to get off the ship. I snapped a few more pictures as we got a little bit closer…it looked SO INCREDIBLE and we were so excited. We went and had breakast and then got our stuff together and got ready to hit the beach. WHEEEEE!!!! We docked over on the far right in the picture and went to the second beach over on the left in the picture. There is a little tram that takes you to the different locations on the island. We found some chairs and umbrellas and dumped all our stuff off and the kids headed out to play in the sand and the water. The weather was INCREDIBLE and I was a bit worried about us getting fried to a crisp. Angelica demonstrates perfect sunscreen application and technique in this next photo.. The kids were so happy and excited to actually be here. We’d been talking and dreaming about Castaway Cay for a long time and the day had finally arrived. And they did amazing at wearing their shirts when I started to get worried about too much sun…. I really do have amazing kids. It was highlighted to me on this trip, just how great these kids of mine are. See, I’ve spent so much of this past year inside of my house and I’ve not been able to see the kids interacting with others. It’s been a very isolated year. I see them bickering with each other and not listening to me and fussing or whining or disobeying and because we are together SO MUCH, I’m sure that they get as sick of each other and me as I do of them….I’m not saying that I don’t love my kids, because I love them fiercely and desperately, but sometimes we all need to be able to have “breathing” time and that time has been sadly lacking from our family over this past year and a bit…..
I’ve seen their faults highlighted by our small insular world and to see how polite they were on the ship and to see how well they handled themselves in interesting and challenging situations…..to see them help others and give to others and be caring and compassionate and gentle and loving and respectful….it was so nice to see all of their positive attributes highlighted like that. It was even more special to have the table beside ours comment to us about our children and how they recognized how much work we must put into them to have them be such well behaved and respectful children. And they sat beside us for the entire week so it wasn’t just one good day….hee hee! Judah got a bit cranky and so I put him to sleep….and then Jon transferred him to a beach chair to sleep for a while. If I try to put him down, 9 times out of 10 he will wake up. If Jon takes him and then puts him down, he will stay sleeping……I have no idea why this is? Any ideas? – it drives me nuts! Jeremy was once again is HEAVEN collecting shells and he even found a whole bunch of live crab thingy’s in their shells…they were just teeny, tiny, but J was SO excited. He and a few of the kids that we played with at the other beaches spent a HUGE portion of time building a sand castle for these little sea creatures. It was the most amazing day and there was even a bit of cloud cover so we weren’t scorching hot. Doens’t that picture look UNBELIEVABLE! The Baby woke up…..and wanted to play in the sand almost immediately.. The lagoon was so shallow and Siah was so excited to be able to swim “all on his own”. I swear that kid is part fish the way that he LOVES the water. Speaking of fish…..can you see this fish? There were these “almost translucent” fish swimming around and the kids had a ton of fun trying to “catch” one. It was so funny to watch. This was such an incredible adventure for our family and such a HUGE blessing for Angelica. This felt like the beginning of a new part in our lives and the end of a terrible time. We are not finished this journey that we are on, but Geli has continued to get stronger and stronger and we are so confident that she will overcome EVERY negative aspect of these past 17 months. When we did get back to the ship we had to hurry because we had been invited to a very “special” event that was happening for the Wish Kids and their families. There were 2 other Wish kids and Families other than ours that were on the ship. We had a private meet and greet with Captain Mickey and Angelica was given a special Captain Mickey doll! This was a day that we will remember for a long time. It was an incredible way to finish up an unbelievable trip. We are so thankful to Children’s Wish for turning this trip from a dream into a reality for Angelica and our whole family. If you are interested in seeing the rest of the photos from Castaway Cay, please click here! There were some pretty cool things that happened on our trip home and so I do have ONE more post about our day of travel home, so check back for the trip round up. Thanks for all your support and love and prayers for us, over this past year and while we were on the trip. You really do mean so much to us and we are so thankful!